SPRINGFIELD, IL. The Illinois Audubon Society has received a donation of land from Maury Brucker and Emiko Yang of Peoria, Illinois. The Hopewell Hill Prairie Nature Preserve and Fern Ridge Nature Preserve are located in Marshall County along the bluffs of the Illinois River. The properties consist of eleven undeveloped lots, totaling 13.26 acres, within the Hopewell Hills Illinois Natural Inventory Site. They have been acquired over the years by Maury Brucker and Emiko Yang and have been actively managed to protect the natural features. Hopewell Hill Prairie Nature Preserve includes several hill prairie remnants while Fern Ridge Nature Preserve is more wooded with healthy populations of ferns and yellow lady-slippers orchids. Significant features within these preserves include very high quality remnant glacial drift hill prairie, mesic-upland forest, and the state-threatened fibrous-rooted sedge. One hundred and twenty-four bird species also have been recorded at these sites including eastern whip-poor-will, red-headed woodpecker, pileated woodpecker and summer tanager. Maury and Emiko have long been involved locally with the Peoria Audubon Society and also with the statewide Illinois Audubon Society where Maury served as President of the Board of Directors during his board term. A management agreement will be developed with the Peoria Audubon Society who will serve as local stewards of the property. 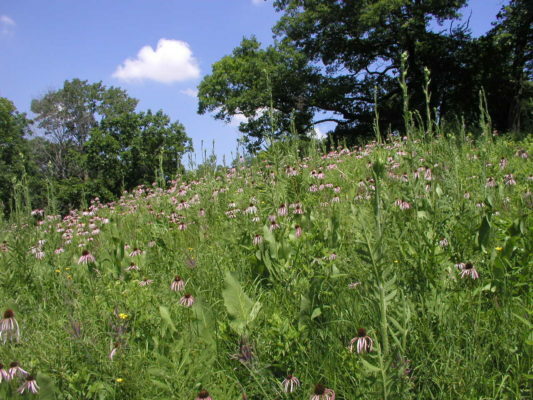 The plan will focus on controlling non-native, invasive woody species; fostering oak regeneration on the upland forests and encourage expansion of the hill prairie community. The mission of the Illinois Audubon Society is to promote the perpetuation and appreciation of native plants and animals and the habitats that support them. The Society is an independent, member supported, statewide, nonprofit organization. Founded in 1897, the Society is Illinois’ oldest private conservation organization with 2200 members, 17 chapters and 19 affiliate groups. The Illinois Audubon Society has now protected more than 5,300 acres by investing $12 million to protect land and water throughout Illinois.